A couple of weeks ago I was looking through my Facebook news feed and up popped once of those sponsored posts that appear every now and then. It was for Pact. Now you know that I am a big fan of Graze - as who doesn't love snacks and things that fit through your letterbox. Well Pact have gone that one step further and can send you pouches of coffee through your letterbox - that's right you don't even have to be in to sign for it or anything. 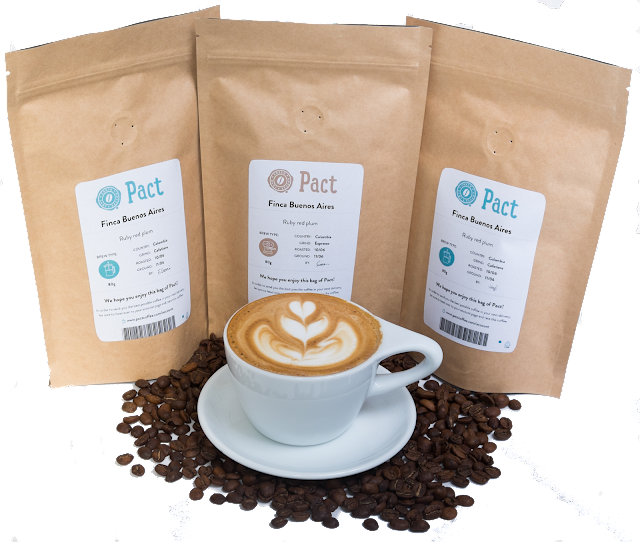 The process is very simple - you register and answer a few questions and then Pact will recommend a coffee for you. They do offer their first time customers a pouch for a £1 - or you might have to get a code of someone who has purchased before ... I'm not too sure. Feel free to use mine if you want it's in the picture above. I was recommended Fruit & Nut Espresso and I have to say I'm not a big fan of coffee but I did enjoy this one. Let me know if you have tried or thought about trying Pact before. It's such a great idea and if you manage to get your first bag for £1 then thats a steal straight away. Oh I should mention it is subscription service so you'll need to stop/start when you choose.